Step back to early 20th Century New England. Here, the horrible "Great Old Ones" mysterious inhabitants of a dark, unfathomable void-seek entry into our world. One of their imprisoned overlords gathers them, just as his worldly servants open portals throughout Arkham for the coming onslaught. Only Salem's master witch, Robert Craven, holds the key to safeguarding mankind. He plans to gather a team of intrepid scholars to find the hidden portals and close them with powerful magic seals. The noble witch's elite team must battle the threat of madness, duel the dark servants, tackle mystical challenges, and face their ultimate nemesis: an unidentified Great Old One with an unknown and incalculable strength. 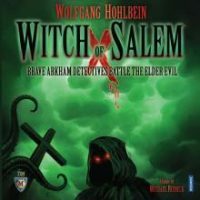 In "Witch of Salem," you step into the terrifying world of renowned storyteller Wolfgang Hohlbein, a mythos inspired by the tales of H. P. Lovecraft. You play one of the witch's scholarly allies. Working cooperatively with your cohorts, uncover the secrets of the Necronomicon, combat creeping insanity, defeat the coming Evil, and bar the Great Old Ones from exiting the inter-dimensional abyss. Add a Review for "Witch of Salem"